As someone who’s spent virtually his entire career in local search, I’m by no means an early proponent of email. But in my interactions at marketing conferences, studies of industry research, and social media conversations, I get the feeling that many of my peers are even further down the adoption curve than I’ve been. With this post, I encourage you to take a hard look at email marketing for yourselves, or an even harder look if you’ve already done so. If you’ve focused exclusively on offering SEO and SEM services to clients in the past, I hope I’ll convince you that email should be a natural and profitable complement to those offerings. And if you’re a local business reading this post, I hope many of these points convince you to take a look at email marketing yourselves! With a return on investment (ROI) of 44:1, marketers consistently rate email as the top-performing channel. According to Campaign Monitor, that ROI has actually increased since 2015, and it’s particularly true for B2B companies. Despite the supposed unpopularity of email among millennials, it remains far and away the most-preferred channel by which to receive communication from a business. The fact that email’s so cheap helps the denominator of that 44:1 stat a bunch. Mailchimp is free up to 2,000 subscribers, as are MailerLite and SendinBlue, and many other providers offer plans under $ 10/month depending on your number of subscribers. It’s also cheap in terms of time cost. Unlike social media where daily or even hourly presence performs best, email allows you to duck in and duck out as you have time. 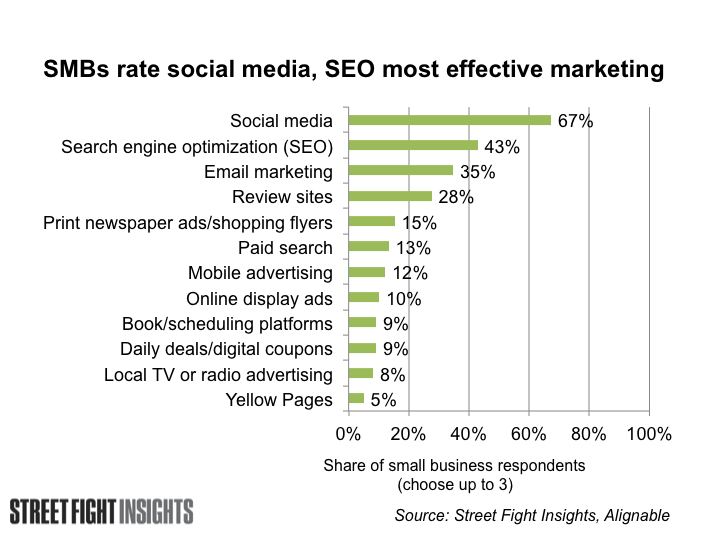 As far as the numerator, average open rates far exceed social media reach on most platforms. And even if they don’t open, ⅓ of people report purchasing based on an email they received from a brand (!). Search provides better purchase intent, but the top-of-mind awareness and referral potential from email is unmatched. Gathering customer email addresses is essential for other critical forms of local business marketing already — you need an email address to ask for a review, build lookalike audiences, and make customer intelligence solutions like FullContact most effective. Actually offering something of value, whether that’s a discount code, loyalty program, whitepaper, or newsletter subscription, increases the odds of earning that email address for all of those purposes. Frankly, the number of organic digital channels available to small businesses is shrinking. Facebook’s latest announcement signals a tough road ahead there for businesses without the budget to Boost posts, and Google’s expansion of its Local Service Ad program to verticals and locales across the United States in the next couple of years seems inevitable to me. Now is the time to start building an email program as these monetization pressures intensify. Your customers know it works. Local businesses might be more aware of email’s potency than some of the agencies that are serving them. Email consistently rates among the top three marketing channels in industry surveys by the Local Search Association, StreetFight, Clutch, and more. At the very least, email requires barely any client education. Unlike the black box of SEO or the complexity of PPC, by and large, small businesses inherently understand email marketing. They know they should be sending emails to their customers, but many of them just aren’t yet doing it, or are doing it poorly. Unlike so much of the behind-the-scenes work that leads to success in SEO, clients can actually see an email campaign delivered to their inbox, as well as the results of that campaign: every major Email Service Provider tracks opens and clicks by default. I already mentioned some of the ways that email marketing complements other channels above. But it can tie in even more closely to an agency’s existing content offering: many of you are already developing full content calendars, or at the very least social content. Building email into your client content strategy can help their content reach a deeper audience, and possibly even a different audience. Though you could argue that the Gmail and Apple Mail interface configurations are algorithms of a kind, generally speaking, email marketing is not subject to wild algorithmic changes or inexplicable ranking fluctuations. And unlike Google’s unrealistic link building axiom that great content will naturally attract inbound links, great content actually does naturally attract more subscribers and more customers as they receive forwarded emails. You can expand it over time. Unlike SEO for local businesses, which generally includes relatively easy wins up front and gets progressively harder to deliver the same value over time, email marketing offers numerous opportunities to expand the scope of your engagement with a client. Beyond fulfilling the emails themselves, there are plenty of other email-related services to offer, including managing and optimizing list sign-up, welcome emails and drip campaigns, A/B testing subject lines and content, and ongoing customer intelligence. Use a reputable Email Service Provider. Running an email marketing program through Gmail or Outlook is an easy way to get your primary address blacklisted. You also won’t have access to open rate or click rate, nor an easy way to automate signups onto specific lists or segments. 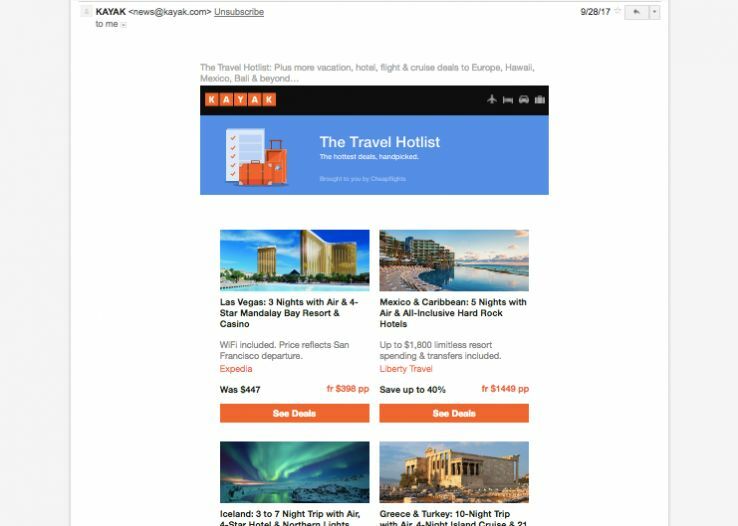 Setting expectations for your subscribers and then following through on those expectations is a particularly important practice for email newsletters, but also holds true for explicitly commercial emails and automated emails. You should be generally consistent with the day on which you send weekly specials, appointment reminders, or service follow-ups. Consistency helps form a habit among your subscribers. Consistency also applies to branding. It’s fine to A/B test subject lines and content types over time, but don’t shoot yourself in the foot from a brand perspective by designing every email you send from scratch. Leave that kind of advanced development to big brands with full in-house email teams. 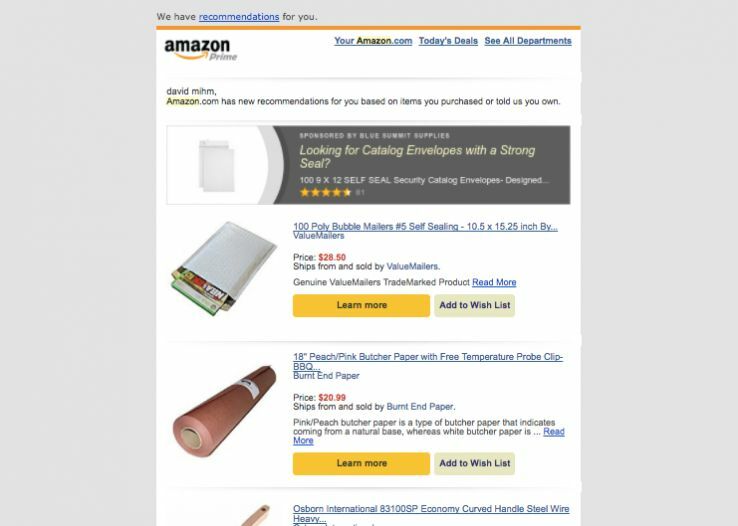 The other reason to be consistent is that designing for email is really, really difficult — a lesson I learned the hard way last year prior to launching Tidings. Complex email clients like Microsoft Outlook use their own markup languages to render emails, and older email clients can’t interpret a lot of modern HTML or CSS declarations. Make sure your layout renders well on phones, since that’s where more than 2/3 of email gets opened. Two- or three-column layouts that force pinching and zooming on mobile devices are a no-no, and at this point, most subscribers are used to scrolling a bit to see content. As long as your template reflects your brand accurately, the content of that layout is far more important than its design. Look no further than the simple email layouts chosen by some of the most successful companies in their respective industries, including Amazon, Kayak, and Fast Company. Pick a layout that’s proven to work on phones and stick with it. Include an email signup button or form prominently on your website. It’s become a best practice to include social icons in the header and/or footer of your website. But there’s an obvious icon missing from so many sites! An email icon should be the first one in the lineup, since it’s the channel where your audience is most likely to see your content. Also consider using Privy or Mailmunch to embed a signup banner or popover on your website with minimal code. Plenty of people way smarter than me are on the newsletter bandwagon (and joined it much earlier than I did). Moz has been sending a popular “Top 10” newsletter for years, Kick Point sends an excellent weekly synopsis, and StreetFight puts out a great daily roundup, just to name a few. As a subscriber, those companies are always top-of-mind for me as thought leaders with their fingers on the pulse of digital marketing. But newsletters work far beyond the digital marketing industry, too. I love that description. 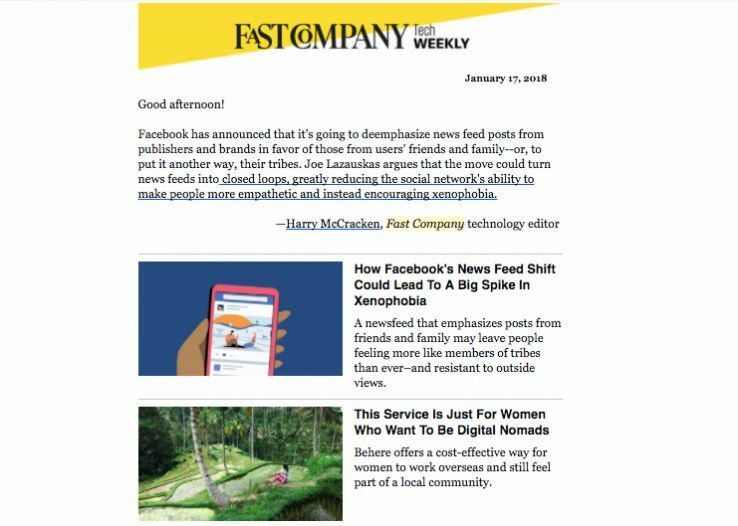 I think of a newsletter as a more personalized social channel. In the ideal world it’s halfway between a 1:1 email and a broadcast on Facebook or Twitter. Granted, a newsletter may not be right for every local business, and it’s far from the only kind of email marketing you should be doing. But it’s also one of the easiest ways to get started with email marketing, and as Sam Dolnick said, an easy-to-understand way to start building relationships with customers. For more newsletter best practices, this ancient (1992!) article actually covers print newsletters but almost all of its advice applies equally well to digital versions! A great option or a strategic imperative? 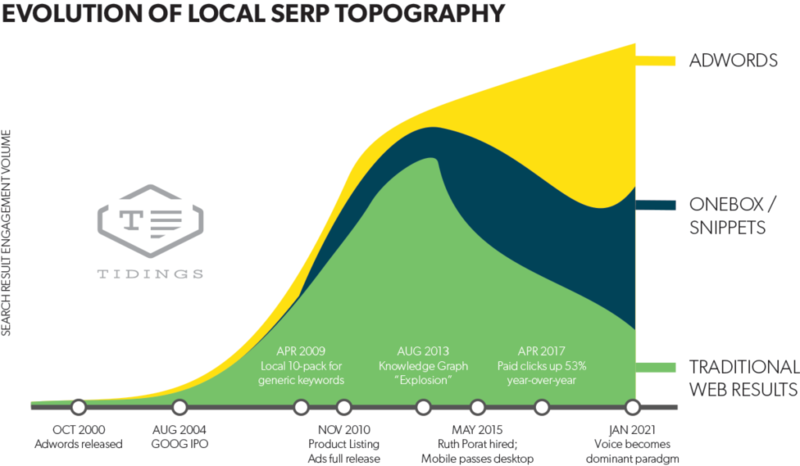 Facebook’s ongoing reduction in organic visibility, Google’s ongoing evolution of the local SERP, and the shift to voice search will combine to create an existential threat to agencies that serve smaller-budget local businesses over the next 2–3 years. Agencies simply can’t charge the margin to place paid ads that they can charge for organic work, particularly as Google and Facebook do a better and better job of optimizing low-budget campaigns. More ads, more Knowledge Panels, and more voice searches mean fewer organic winners at Google than ever before (though because overall search volume won’t decline, the winners will win bigger than ever). Basic SEO blocking-and-tackling such as site architecture, title tags, and citation building will always be important services, but their impact for local businesses has declined over the past decade, due to algorithmic sophistication, increased competition, and decreased organic real estate. As a concrete, high-margin, high-ROI deliverable, email should be a centerpiece of those additional services. And if it just doesn’t feel like something you’re ready to take on right now, Tidings is happy to handle your referrals :D!